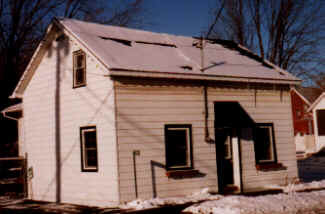 This house is located on Roger Stevens Drive just west of Main Street and is reputed to be the oldest surviving house in North Gower. It is of log construction under its aluminum siding. Evidence of this is the depth and thickness of the window and door frames. The original part of the house has no cellar. No decisive evidence has been discovered either to substantiate or to disprove the claim that this building is the oldest in the village. The late Mr. Hugh Craig stated that the house was built before his own family home was erected in 1864, and certainly the log construction indicates a building of considerable age. However, a precise date has not been found. An early owner of the house was apparently Richard Pettapiece who, according to Registry Office records, bought 10,000 square feet of lot 20, concession 4, from Alan Barr in 1867. This is probably the property that the house sits on, but the house may have been built prior to the land purchase. In 1886, Richard Pettapiece's will left all of village lot 40, plan 91, to R. Pettapiece and in 1907 James Pettapiece and wife sold lot 40 to Jemima Haggins for $300. To be balanced against this evidence of ownership is the [not necessarily inconsistent] suggestion that Richard left the house to or for the use of his daughter Betty Jane, a weaver who never married. One version of a favourite piece of local history, the North Gower coal oil scandal of 1865, holds that it was Betty Jane who initiated the chain of events that led some to think that North Gower was soon to gain a place on the world's oil-producing map. According to this version, Betty Jane wanted a well dug in her backyard and hotelier Jimmy Johnston sent over a labourer one evening to commence the digging. His lamp accidentally fell into the pit and some coal oil was spilled. Someone else later discovered the oil and rumors began. In October, 1865, the First International Oil Company of Ogdensburg sent up prospectors and a 365 foot well was dug. Apparently oil was added to the hole every night to encourage the prospectors, and this ploy succeeded to the extent that Jimmy Johnston's hotel enjoyed a lucrative year. The oil company left in September of 1866. A somewhat more probable version of events suggests that the original digging was done at the old cheese factory [burnt in 1932], some 40 rods west of Main Street 78 near what is now 2357 Roger Stevens Drive q.v. The large well dug by the oil company provided a useful supply of water for the cheese factory and the community skating rink. Registry records show that in 1907 Jemima Haggins sold the property to Melissa Mains for $300. and it appears that by this time clapboard siding had been added to cover the logs. In 1915 the property was granted to Melissa's son Newman, subject to a life estate of the grantor. In 1943 Newman sold to Thomas Hicks who lived next door [see 2337 above]. The property passed to Annie Hicks in 1944 and she sold to Annie Gault in 1945. While he owned the property, Thomas Hicks converted a backyard woodshed into a kitchen.